Every type of metal has a unique composition and has a different resistance to the flow of electrical current. This is termed the resistively constant for that metal. For most metals the change in electrical resistance is directly proportional to its change in temperature and is linear over a range of temperatures. This constant factor called the temperature coefficient of electrical resistance (short formed TCR) is the basis of resistance temperature detectors. The RTD can actually be regarded as a high precision wire wound resistor whose resistance varies with temperature. By measuring the resistance of the metal, its temperature can be determined. Several different pure metals (such as platinum, nickel and copper) can be used in the manufacture of an RTD. A typical RTD probe contains a coil of very fine metal wire, allowing for a large resistance change without a great space requirement. Usually, platinum RTDs are used as process temperature monitors because of their accuracy and linearity. To detect the small variations of resistance of the RTD, a temperature transmitter in the form of a Wheatstone bridge is generally used. The circuit compares the RTD value with three known and highly accurate resistors. A Wheatstone bridge consisting of an RTD, three resistors, a voltmeter and a voltage source is illustrated in Above Figure. In this circuit, when the current flow in the meter is zero (the voltage at point A equals the voltage at point B) the bridge is said to be in null balance. This would be the zero or set point on the RTD temperature output. As the RTD temperature increases, the voltage read by the voltmeter increases. If a voltage transducer replaces the voltmeter, a 4-20 mA signal, which is proportional to the temperature range being monitored, can be generated. As in the case of a thermocouple, a problem arises when the RTD is installed some distance away from the transmitter. Since the connecting wires are long, resistance of the wires changes as ambient temperature fluctuates. 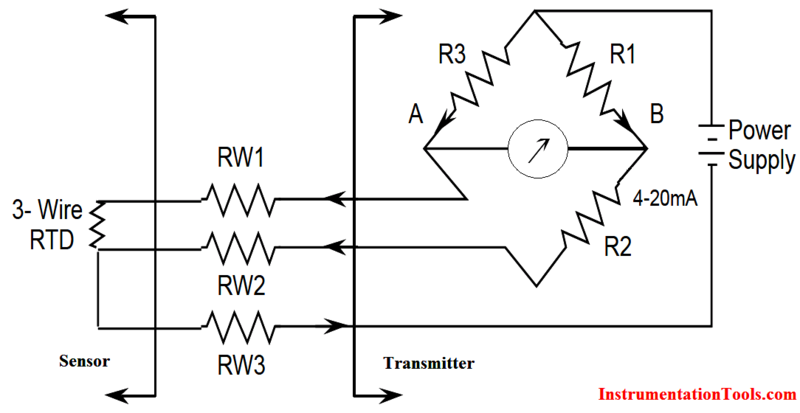 The variations in wire resistance would introduce an error in the transmitter. To eliminate this problem, a three-wire RTD is used. The connecting wires (w1, w2, w3) are made the same length and therefore the same resistance. The power supply is connected to one end of the RTD and the top of the Wheatstone bridge. It can be seen that the resistance of the right leg of the Wheatstone bridge is R1 + R2 + RW2. The resistance of the left leg of the bridge is R3 + RW3 + RTD. Since RW1 = RW2, the result is that the resistances of the wires cancel and therefore the effect of the connecting wires is eliminated. The response time compared to thermocouples is very fast  in the order of fractions of a second. An RTD will not experience drift problems because it is not selfpowered. Within its range it is more accurate and has higher sensitivity than a thermocouple. In an installation where long leads are required, the RTD does not require special extension cable. Unlike thermocouples, radioactive radiation (beta, gamma and neutrons) has minimal effect on RTDs since the parameter measured is resistance, not voltage. Because the metal used for a RTD must be in its purest form, they are much more expensive than thermocouples. In general, an RTD is not capable of measuring as wide a temperature range as a thermocouple. Small changes in resistance are being measured, thus all connections must be tight and free of corrosion, which will create errors. An open circuit in the RTD or in the wiring between the RTD and the bridge will cause a high temperature reading. Loss of power or a short within the RTD will cause a low temperature reading. Such a good site to increase knowledge and development. Thank you so much to put up all this important info on this site really helps alot.